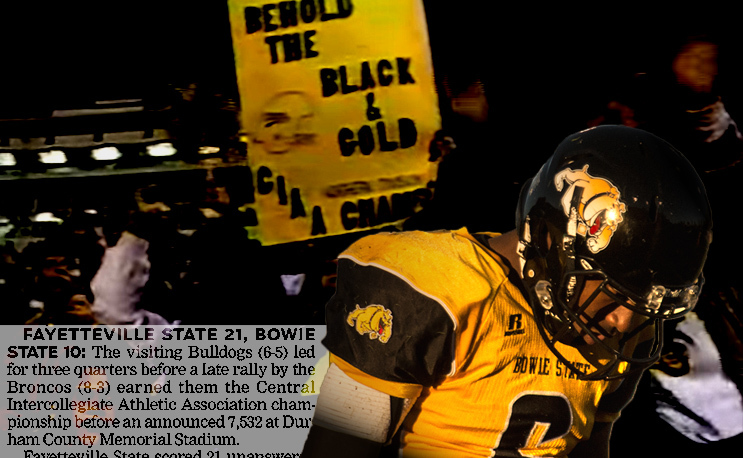 Bowie State’s quest for a CIAA title has been long and filled with disappointments. Amir Hall and Co. are hoping that ends on Saturday. Two years ago, a sophomore Amir Hall walked off the field at Salem Football Stadium battered and bruised. The Bowie State quarterback and his team had seen a second consecutive season go up in flames in the CIAA title game. The 43-33 loss to Winston-Salem State was highlighted by four Hall interceptions. The first year starter also threw for 348 yards and came up with four touchdowns, but he still knew he and his team left something on the table that day. Bowie State entered the CIAA in 1980, and spent most of its first decade in the cellar. Despite being the conference’s geographical north star, it was placed in the Southern Division which meant lots of trips to North Carolina. Coincidentally, it was a bottom feeder for the league, which included teams like North Carolina Central, Hampton and Norfolk State as well as a powerhouse team at Virginia Union. BSU lost 34 consecutive games from 1984 through 1987. Then, in 1988, it suddenly became a force. The Dave Dolch coached BSU squad finished 9-2-1 that season, finishing second in the division to WSSU and making the D2 playoffs. Following the season, it was revealed that the program used several ineligible players, most of them transfer players whose transcripts did not meet NCAA requirements. It was not required to forfeit any games because they didn’t win any championships, according to then-interim CIAA commissioner Leon Kerry. Led by former Baltimore Colts linebacker Sanders Shiver, BSU’s program continued to win, claiming the Northern Division title the following year. Led by quarterback Henry Frazier, BSU played a tough, gritty brand of ball that allowed it to knock off nationally ranked VUU and WSSU squads in the regular season. On Nov. 11th at Byrd Stadium, BSU held off a late WSSU rally attempt for a 28-24 win in front of 6,700 fans and a BET audience. The jubilation was short-lived, however. Just two years later the CIAA stripped Bowie State of all wins and awards (besides women’s basketball) from the 1989-1990 school year, including the prized-CIAA title. Since that short-lived victory nearly 30 years ago, Bowie State has been unable to plant its flag on the CIAA mountain top. BSU has been to the title game five times in the last two decades, losing once to North Carolina Central, twice to Winston-Salem State (2015 and 16) and twice again to Fayetteville State in 2002 and 2009. Saturday’s game is a chance for both Hall and Bowie State to put their championship frustrations behind them as they hope the third time against Fayetteville State will be the charm. A title would not only complete Hall’s legacy in the CIAA, it would also give his school a title it can hold on to.